Director Martin Scorsese, during an appearance at the Cannes Film Festival, has revealed details of the George Harrison documentary he's been working on and is planning to release in 2011. For the past three years, the famed director has been developing the project with Harrison's widow, Olivia. 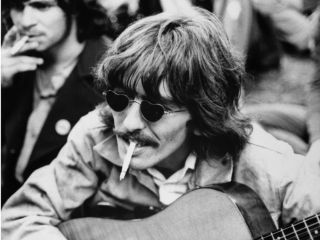 Tentatively titled Living In The Material World: George Harrison, the documentary will chronicle the late guitarist's life before, during and after his time in The Beatles. Scorsese, who met with George Harrison several times, says that he feels a deep connection to the guitarist's spirituality. "That subject matter has never left me," Scorsese told the Hollywood Reporter. "The more you're in the material world, the more there is a tendency for a search for serenity and a need to not be distracted by physical elements that are around you." Regarding Harrison's music, Scorsese said he took on the project from a fan's perspective, telling of how he was getting ready for school at NYU one morning in the early '60s and heard an AM disc jockey announce that he was going to play the very first stateside single of The Beatles. Scorsese said he heard the song and felt it was the first time that British pop could stand up to the scene in America. "His music is very important to me," said Scorsese, who has combed through materials - letters, drawings, even a cassette of unreleased music from 1966 - Olivia Harrison has saved over the years. "So I was interested in the journey that he took as an artist. The film is an exploration. We don't know. We're just feeling our way through...This is undertaken, not casually. It's a great deal of reticence and thinking." Hailed as one of the world's greatest living filmmakers (Taxi Driver, Raging Bull, Goodfellas), Scorsese has also helmed some of the most acclaimed rock 'n' roll films in history, such as The Last Waltz and the Bob Dylan documentary No Direction Home. On the subject of rock movies, Scorsese said, "Even though it's complex and it's hard to do, in a very complicated way it frees me from the strictures of the feature and makes me think - I hope - a little more clearly about the feature. Because there's something in these films that had a narrative freedom to them, and it's something that the features may be going this way, and the nonfiction films are going this way, and somehow you hope they interweave."